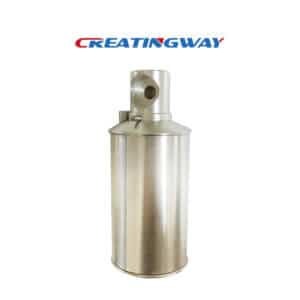 Metal cans cnc machined includes more metal components machined and assemble together to save room before shipment. Cans components has CNC Machining, Milling, Lathe, EDM and anodizing, power coating. Material: 6061T6 aluminum and 316 stainless steel. Lead time: 10 days (Included sample approve). The customer in Israel who design primary drawing and work with our engineer team to get final drawing freeze for production, the product application to electronic equipment purposed, included electronic components assembled. The metal shell included different metal aluminum and stainless steel materials. The top hexagon parts we have to use 4 axis CNC machined, and need to assemble top cover with vertical center line. The top head with two pole of 316SS need to vertical each other. Whole products was assembled, we have to good anodizing and coating finishing. Own 6 CNC machining center and 6 milling machines, and 8 CNC auto lathes. Have EDM, grinding and in inspection facilities in house. We have to make facilities to fix parts in different surface for machining, and we have to make the center slot with top head parts center pole matching. There is total six surface need to machining, we need to find center point to fix then machining it, meanwhile, we need to make sure the center hole with top head of pole is vertical, so parts machining difficulty is added. After machined, we need to make the part polishing and anodizing. 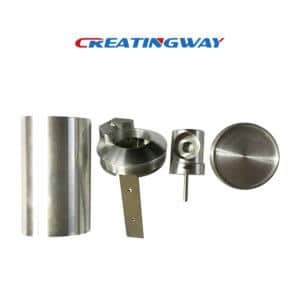 When we have completed these CNC machined parts, we have to 2nd process finishing to do these parts aesthetic like anodizing, polishing and power coating, Anodizing improves the corrosion resistance of the aluminum surface, and provide one hard scratch-resistant surface, and enhances the parts of appearance. Of course, we can provide you more part finishing services, visit us for more details, including anodizing, painting, electroplate, PFTE coating etc. When we have assembled the coating process, we will inspect all of parts, then inspect them and assemble to testing function to ship to our customers, they will add more electronic parts into to complete whole assemble products then selling them to marketing, we hope that our customers is quickly launched the new products to marketing and get more orders.